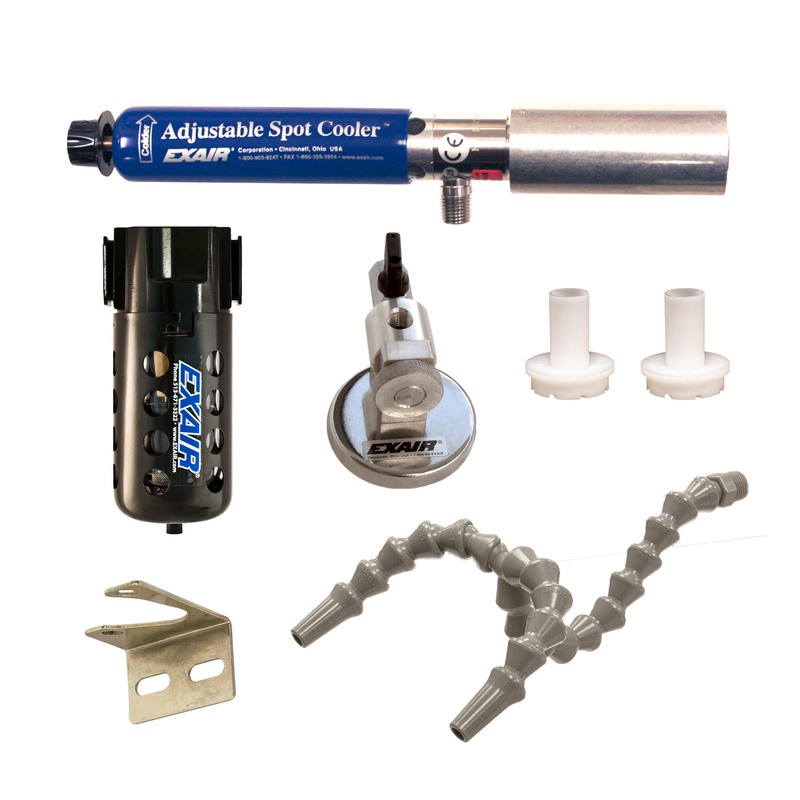 EXAIR's Adjustable Spot Cooler System (two cold outlets) includes everything needed for a dual point cooling station that offers a low cost, reliable, maintenance free solution to a variety of industrial spot cooling problems. With the turn of a knob, you can select a precise temperature setting from -30°F (-34°C) to room temperature. A swivel Magnetic Base provides easy mounting and portability. A Dual Point Hose kit (with cone and fan nozzles) directs the cold air to two locations at once. 15 & 30 SCFM (425 & 850 SLPM) generators are included and a 25 SCFM (708 SLPM) generator is installed. No moving parts or CFC's assures maintenance free operation. What is the difference between the Cold Gun and the Adjustable Spot Cooler?What is a Vortex Tube?Can I connect the output of a Vortex Tube to an Air Amplifier?What is the difference between the Model 3825 and Model 3925 Adjustable Spot Cooler Systems?How does a Vortex Tube work?What is the difference between the Vortex Tube and other cold air products like the Cold Gun?What does the Vortex Tube Performance Chart tell me?I have a Vortex Tube, but the air coming out is not very cold. Why?How will warm compressed air affect a Vortex Tube?Can I put backpressure on the cold exhaust of a Vortex Tube?How do I know what Cold Fraction my Vortex Tube is set to?Which Vortex Tube do I use?How are Vortex Tubes rated?How do I know which Vortex Tube I have?How long have Vortex Tubes been around?Can I use a Vortex Tube to cool my electrical enclosure instead of a Cabinet Cooler?Can I connect the output of a Vortex Tube to an Air Knife?Can I connect the output of a Vortex Tube to an Air Amplifier or Air Knife?Can I put cold air from a Vortex Tube into the Super Air Wipe? The Adjustable Spot Cooler incorporates a vortex tube to convert an ordinary supply of compressed air (1) into two low pressure streams, one hot and one cold. With the turn of a knob, the temperature control valve (2) allows some hot air to flow through a muffling sleeve and out the hot air exhaust (3). The opposite end provides a cold airstream (4) that is muffled and discharged through the flexible hose, which directs it to the point of use. The swivel magnetic base (5) provides easy mounting and portability. *25 SCFM (708 SLPM) generator is factory installed. Air consumption is based on generator installed. 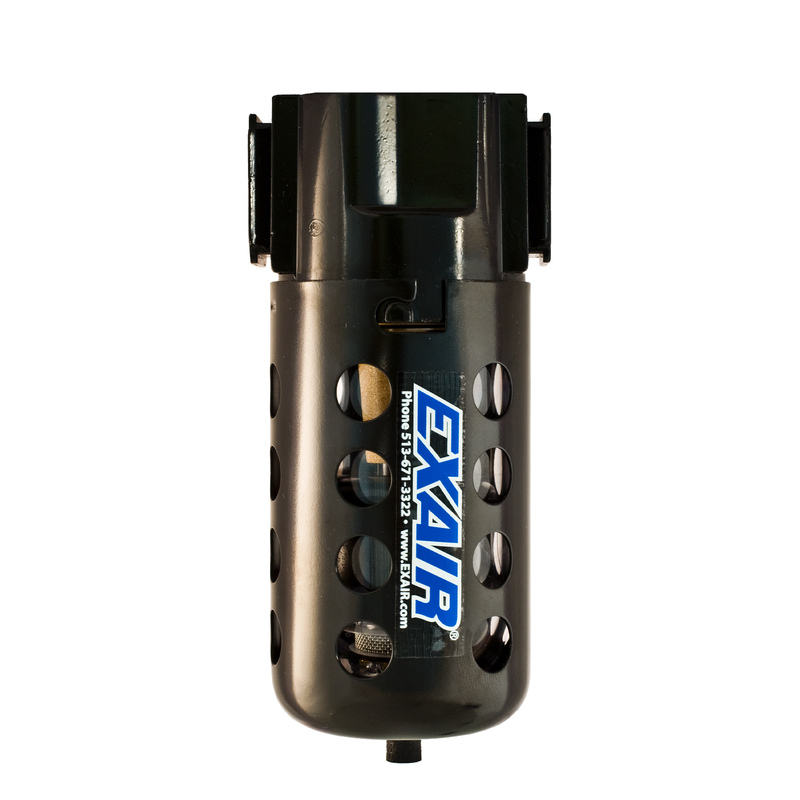 EXAIR Adjustable Spot Coolers comply with OSHA's Safety Requirements, the EU General Product Safety Directive (2001/95/EC) and meet the noise limitation requirements of the EU Machinery Directive (2006/42/EC). All sound level measurements are taken at 3 feet away. ► A Phenomenon of Physics! 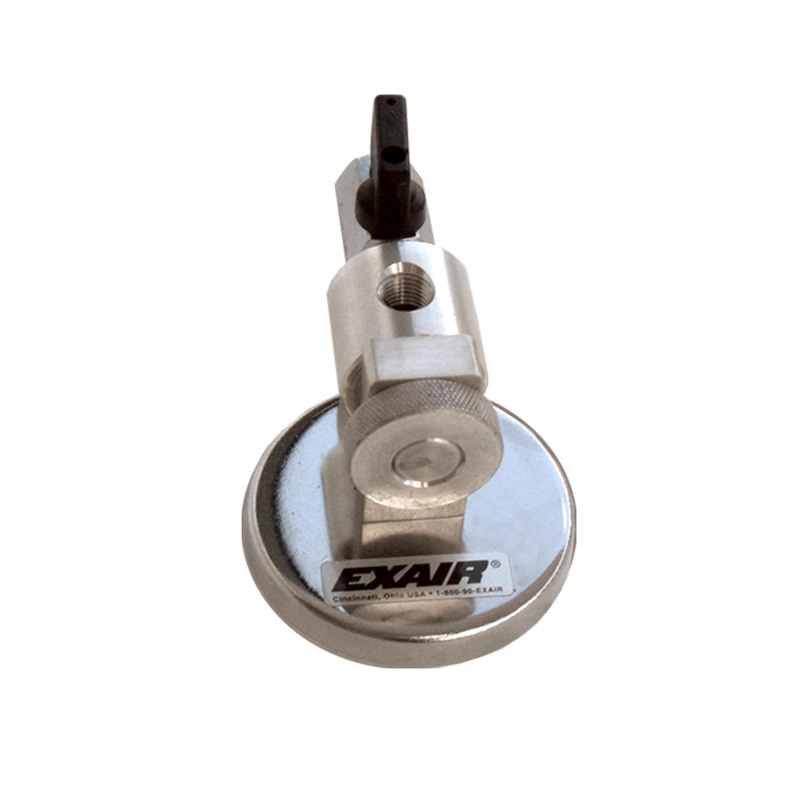 EXAIR's Adjustable Spot Cooler being used to quickly test thermostat heat tapes. The Problem: A manufacturer of electrical heat tapes had a problem testing thermostats for accuracy. The heat tape is supposed to switch on when the outdoor temperature dips below 40°F to prevent pipes from freezing or ice from building up on a roof ’s edge. The liquid-tight thermostat of every tape had to be dipped into a bowl of ice water (thermometer checked at 36°F (2°C)) to make sure the indicator light came on and the tape got warm. Summertime heat caused the water to heat up so quickly that more time was spent regulating the water temperature than testing thermostats. The Solution: The water bath was replaced with a Model 3825 Adjustable Spot Cooler. Once set to their desired temperature of 36°F (2°C), it provided a stable temperature all day long without adjustment. Drying each heat tape was no longer required and testing was over in seconds. Comment: The Adjustable Spot Cooler paid for itself in no time as a result of the increased productivity. In this case, the company used the included 15 SCFM (425 SLPM) generator which minimized the compressed air use, costing only 23 cents per hour of continuous use! When testing thermostats, cooling machined plastics, setting hot melts or controlling tolerances, the Adjustable Spot Cooler is the best choice. The two questions we’re most often asked about the vortex tube are, “How long has it been around?” and “How does the thing work?” The following is a brief history and theory of the vortex tube. The vortex tube was invented quite by accident in 1928. George Ranque, a French physics student, was experimenting with a vortex-type pump he had developed when he noticed warm air exhausting from one end, and cold air from the other. Ranque soon forgot about his pump and started a small firm to exploit the commercial potential for this strange device that produced hot and cold air with no moving parts. However, it soon failed and the vortex tube slipped into obscurity until 1945 when Rudolph Hilsch, a German physicist, published a widely read scientific paper on the device. Much earlier, the great nineteenth century physicist, James Clerk Maxwell, postulated that since heat involves the movement of molecules, we might someday be able to get hot and cold air from the same device with the help of a “friendly little demon” who would sort out and separate the hot and cold molecules of air. Thus, the vortex tube has been variously known as the “Ranque Vortex Tube”, the “Hilsch Tube”, the “Ranque-Hilsch Tube”, and “Maxwell’s Demon”. By any name, it has in recent years gained acceptance as a simple, reliable and low cost answer to a wide variety of industrial spot cooling problems. A vortex tube uses compressed air as a power source, has no moving parts, and produces hot air from one end and cold air from the other. The volume and temperature of these two airstreams are adjustable with a valve built into the hot air exhaust. Temperatures as low as -50°F (-46°C) and as high as +260°F (+127°C) are possible. Compressed air is supplied to the vortex tube and passes through nozzles that are tangent to an internal counterbore. These nozzles set the air in a vortex motion. This spinning stream of air turns 90° and passes down the hot tube in the form of a spinning shell, similar to a tornado. A valve at one end of the tube allows some of the warmed air to escape. What does not escape, heads back down the tube as a second vortex inside the low-pressure area of the larger vortex. This inner vortex loses heat and exhausts through the other end as cold air. While one airstream moves up the tube and the other down it, both rotate in the same direction at the same angular velocity. That is, a particle in the inner stream completes one rotation in the same amount of time as a particle in the outer stream. However, because of the principle of conservation of angular momentum, the rotational speed of the smaller vortex might be expected to increase. (The conservation principle is demonstrated by spinning skaters who can slow or speed up their spin by extending or drawing in their arms.) But in the vortex tube, the speed of the inner vortex remains the same. Angular momentum has been lost from the inner vortex. The energy that is lost shows up as heat in the outer vortex. Thus the outer vortex becomes warm, and the inner vortex is cooled. Use our Application Assistance Worksheet to submit information about your application. When you submit this information, we will respond with our recommendation for the EXAIR product best suited for the application. Please complete the Application Assistance Worksheet and click submit or print the completed .pdf file and fax it to us at (513) 671-3363. For immediate help, call our Application Engineering Department at 1 800-903-9247.